Make sure you pick a healthy pumpkin. 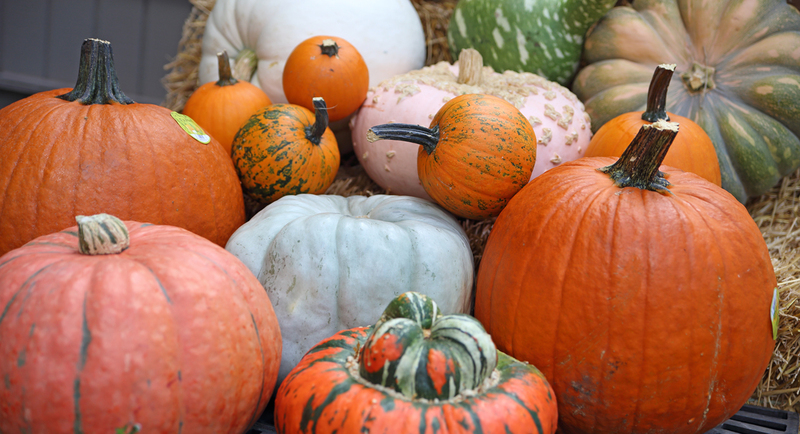 The skin of a pumpkin is it’s protective layer, so look for bruising, cuts and any signs that this layer is broken. Poke to make sure there are no soft spots, which is an early sign of rotting. It’s also important to find pumpkins that are locally sourced. Pumpkins that are shipped long distances are more likely to be damaged in this shipping process. That’s why every one of the pumpkins you’ll find at your local Prairie Gardens are locally grown! They’re healthier and happier…and it shows. Cleaning your pumpkin as soon as you get it home is important to remove any bacteria and give it a good start. Mix about 1 teaspoon into a gallon of water and spray the outside of your pumpkin and give it a good rub and clean. Make sure it is totally dry when finished. One of our experts tricks is to seal your un-carved pumpkins with Amor All Car Protectant. It will both help protect your pumpkin from both outside elements and give it a nice shine and enhanced color! WD-40 is also another great option, since it contains mineral oil, keeping your pumpkin hydrated and protected. Once you cut into a pumpkin’s skin you are exposing it to the elements, which leads to rot. That’s why it is best to wait to crave until close to Halloween, for all those trick-or-treaters to see. If you want your pumpkin looking in tip-top-shape, wait to carve it until about a week before the holiday. There are also tons of fun ways to decorate pumpkins with ribbon, paint, florals and more instead of carving it up! Gut it: When it does come time for carving, make sure you remove and clean out all the pumpkin guts very well. Exposed pumpkin guts will be the first to rot, so make sure they are all removed. Soak it: Just like when cleaning the outside of your pumpkin before carving, a bleach water solution can also help after carving. Submerge your carved pumpkin in the bleach/water solution to give it a good clean and remove bacteria. Jelly it: Add vaseline around the curved edges of your pumpkin, which will help keep it nice and hydrated. Refrigerate it: If you’re experiencing a batch of warmer weather, give your pumpkin a break by placing it in a refrigerator overnight to cool off.